As humans, it’s in our nature to fit in. Whether or not you’re actively seeking it, deep down, you want the same validation amongst your peers as they do. The feeling of belonging is just something that we naturally seek, and there’s nothing wrong with acceptance among the people that you love in your life. In fact, it’s perfectly normal to seek this. 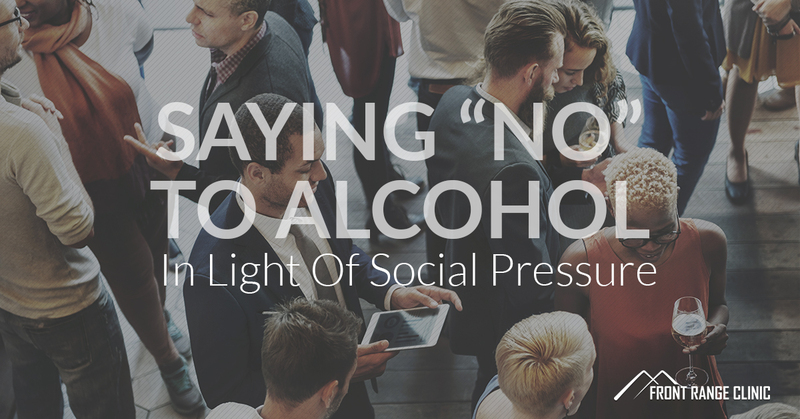 However, for those who have struggled with alcoholism or other drinking-related problems in the past, the idea of socializing with peers in a drinking environment can, understandably, make them feel uncomfortable. Moreso than other states, Colorado has a fairly relaxed and casual attitude toward alcohol and marijuana consumption, especially when you consider the prevalence of dispensaries, breweries, and distilleries. It’s no wonder that people tend to unload all of their stress from work at one of these places. Front Range Clinic wants to let you know that if you’re recovering from an alcohol addiction, it is possible to go out with your friends, family, or coworkers and have a great time socializing all while abstaining from drinking. There’s something to be said about the otherwise unspoken and often-implied nature of consuming alcohol in social settings, and whether this peer pressure stems out of a desire to fit in or is due to deeper, underlying reasons, we’d like to address this matter a little further. Our alcohol treatment centers in Colorado are strategically placed throughout the Front Range (hence our name), spanning from Fort Collins all the way down south to Pueblo. Know that Front Range Clinic is able to provide addiction services that are specifically designed to help individuals work through — and overcome — issues related to alcohol. If you have any questions or you’re in need of assistance, please don’t hesitate to reach out to us. A polite but hard “no” when offered an alcoholic beverage should be enough for your friends or peers to understand that you’re not going to drink. Remember that, though this might be difficult to say, there’s no shame in mentioning that you’re intentionally abstaining from alcohol due to past problems. If the people you’re with are truly your friends or really value you, then they’ll either know that ahead of time, or respect your words in the moment. There’s nothing wrong with enjoying some juice, a soda, or another delicious beverage with zero alcohol in it. If “fitting in” is more about physically holding a drink and casually sipping it during conversation than anything else, then it only makes sense to opt for an alternative beverage. Water is also a great choice because it’s always going to hydrate you, and you can encourage your peers to hydrate a little bit more, too. Offering yourself as the designated driver accomplishes multiple things at once: you’re providing a valuable service to your friends by means of sober, safe transportation, you’re helping them avoid any potentially dangerous situations as a result of intoxicated driving, and no one is going to think twice about you not drinking since you’re the designated driver. Of course, even if you’re not driving, people should still respect the fact that you’re not drinking. The long-term goal is to be comfortable with alcohol abstinence even when it’s around you, but know that it’s perfectly acceptable if you’d rather avoid the situation altogether. There’s nothing wrong with knowing that you may falter due to temptation or peer pressure, and in reality, that’s actually a very wise decision and realization. Doing what you can to avoid alcohol consumption is incredibly important, and sometimes, that requires physically separating yourself from it. Our network of highly accessible, outpatient addiction recovery centers along the Front Range Metropolitan Corridor are here to help you no matter what your situation is. From Medication-Assisted Treatment to behavior counseling, our desire is to help you live a healthy, sober, and fulfilling life free from the chains of alcohol addiction. Contact us today.